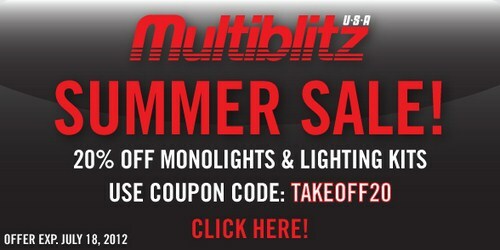 There is a summer sale on monolights and studio lighting at Mulitblitz USA. There is a sale on at Mulitblitz USA. Until 18th July 2012, use the code “TAKEOFF20” and you will get a 20% discount on monolights and studio lighting kits bought from their online store. Click the banner below for further information.